"The dominion of Canada is formally in existence, to the great satisfaction of the politicians who infest the provinces, if of nobody else." 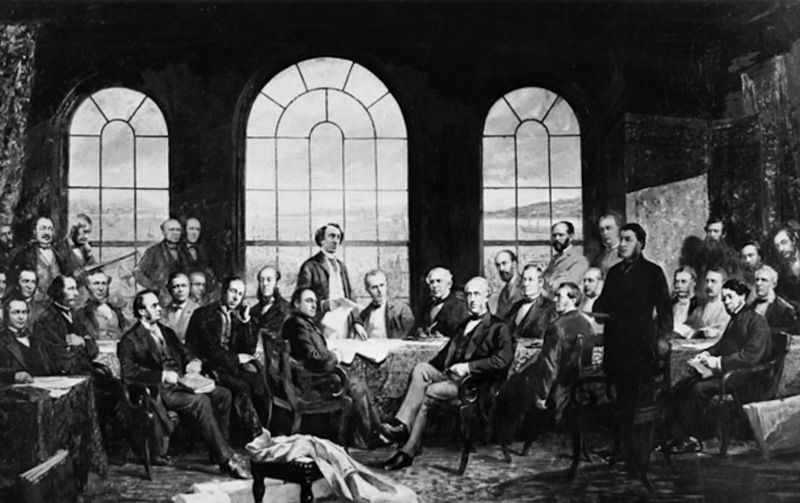 The British North America Act, which became the Constitution of the Canadian Confederation, passed Parliament in March 1867 and went into effect on July 1, now known as Canada Day. The Nation, in typical American fashion, treated the occasion as an opportunity to consider whether the confederation of Canada would hasten or delay the provinces’ more or less inevitable integration with the United States. The dominion of Canada is formally in existence, to the great satisfaction of the politicians who infest the provinces, if of nobody else. Some of these gentlemen, we see, are already talking of a standing army to be counted by the hundred thousand. The people generally, we take it, are waiting to see what benefits are to be derived from the new arrangement; and while the more intensely loyal among them see in the confederation of the provinces a strengthening of the bond which ties them to the mother country, and which at any rate keeps them from drifting towards the United States, the wisest heads among them probably doubt whether the provinces as a republic, bearing the responsibilities of an independent country, will not come this way faster than if they had remained in the colonial state. This drifting is not, however, a process which there is any need of hastening; we in this country are not the losers if there is any loss in the delay. Meantime, we have on our northern border the same number of neighbors as before, something like three and a half millions, and we believe no change in our relations with them is made necessary by the change in their domestic affairs.